make it very enticing for all ages. a restaurant, tennis courts, fitness center, billiards, basketball court, and community clubhouse. 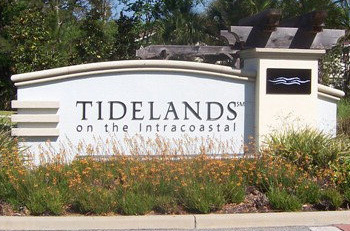 Units in Tidelands are very spacious with two- and three-bedroom floor plans and high quality features. This is a naturally beautiful community with open landscaping, lakes, canals, and of course the Intracoastal Waterway and all its animal inhabitants such as manatees and dolphins. Contact us today to find out more about buying or renting property in Tidelands and discover why everyone is talking about it.